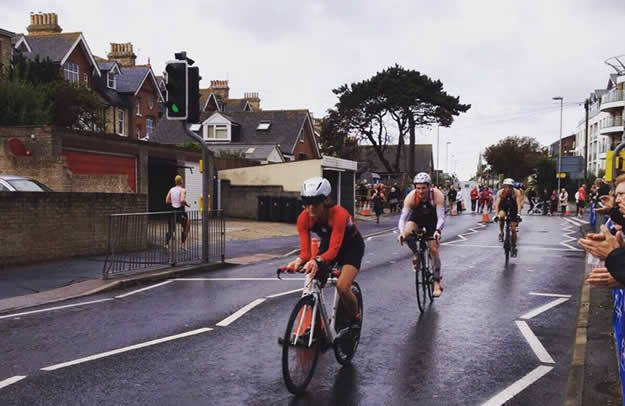 Since writing my race report on Challenge Weymouth, there has been a significant development; British Triathlon have issued me with my Pro/Elite status to enable me to race Pro for the 2016 season... that means there is going to be a winter of hard work ahead! It was brought to my attention that my report was actually quite negative, and I suppose in some ways it was, but that was in no way any reflection on Challenge at all. So what about the race...? Not my race, but THE race? 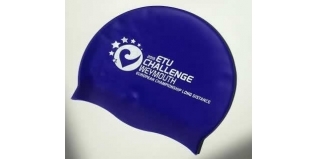 This year Challenge Weymouth played host to the European Long Distance Triathlon Championships which would mean European Age Group Champions would be crowned. Despite my mood, there was a definite buzz surrounding the Pavilion as triathletes from all over Europe dressed in their respective national kits registered and took advantage of the event expo. 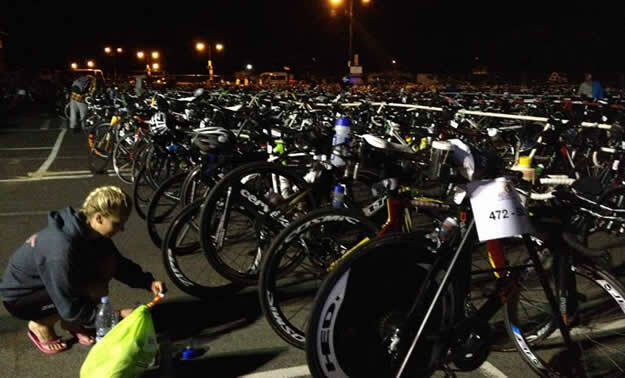 It was the same in transition a few km away at Lodmoor Country Park as athletes racked their bikes and prepared their kit bags for the rigours that lay ahead. I was greeted by my friend Stuart Wright as I walked in, who gave my bike and helmet a quick once over for safety and then escorted me to my number rack. With over a thousand bikes in transition this was a nice touch from the event crew to avoid people wandering around lost in a sea of carbon fibre. Come race morning, the heavens had opened and the rain had started. There are some things the race organisers can't control, but whilst the ground was damp the general mood of the athletes certainly wasn't and with family and friends spectating on the beach as the race got underway, it really was the place to be on Sunday morning. With the start waves split into three, PRO, ETU Age Groupers and the Challenge Age Groupers over the course of 15 minutes, the event was underway. 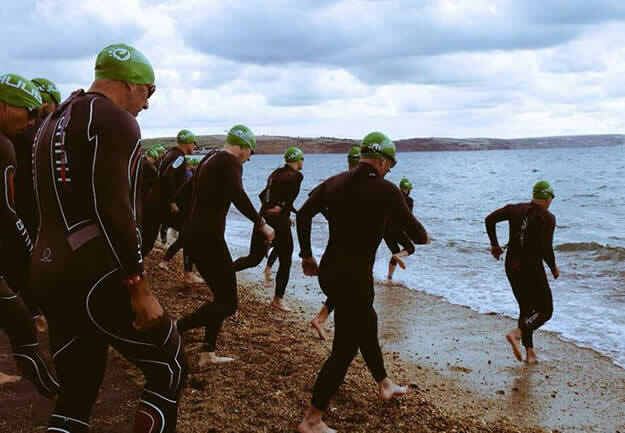 Ahead of the competitors lay two loops of a 1.2 mile sea swim with an Australian style exit to link the two. Despite choppy conditions, Stephen Bayliss clocked a hugely impressive 50 minute time to exit the water in first place. Having reviewed the bike course last month in the build up to the event, I'll quickly recap, the course had changed from last year with the removal of a long out-and-back section. This obviously means the course would be short so the race directors made a change that proved excellent, bringing the bike course back in front of Lodmoor Country Park. It gave spectators the opportunity to see their loved ones and spur them on with cheers of encouragement, just the thing you need at the halfway point. With 112 miles in the legs it was out on to the four lap, 10km run route that would provide the marathon distance and the finale of the race. With a total of four aid stations on each lap (you passed the middle one twice), you are never far away from some vital energy, be it a gel, a coke or some crisps if you're tired of the sweet stuff! The army of volunteers on the aid stations were amazing, a special shout out to the Bustinskin crew, you guys rock! The post-race facilities were superb, with free massage, food and your dry kit bag all on hand so you can start to recover and bask in your personal glory of what you have achieved. This truly is a great race, a fantastic course and a location that sets this as a ‘must-do' iron-distance event. Alan and his team have once again delivered a brilliant event and I know it will be bigger and better in 2016, it's already in my schedule for next year, you should put it on yours too!